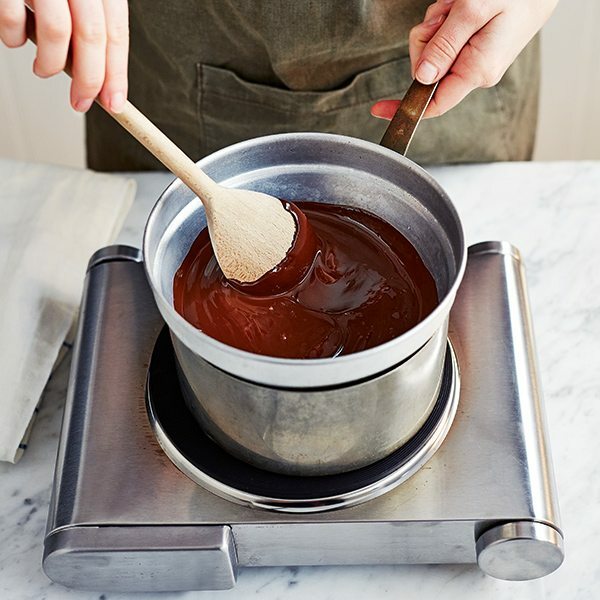 Learn how to temper chocolate with our step-by-step guide so that you can achieve a gorgeously glossy finish every time. Dark chocolate Melt to 45°C, cool to 28°C, then warm to 31-32°C. Milk chocolate Melt to near 45°C, cool to 27-28°C, then warm to 29-30°C. White chocolate Melt to 40-45°C, cool to 26-27°C, then warm to 28-29°C. Chocolate for tempering comes in small buttons or chips, otherwise known as callets, and melts easily. We used Callebaut callets, available from amazon.co.uk, souschef.co.uk or speciality cake shops. If you can’t get hold of them we recommend using Green & Black’s or Lindt bars. 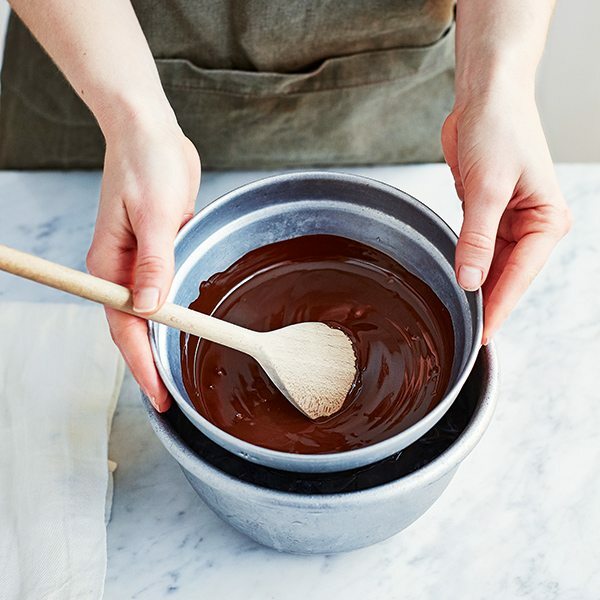 Use a metal bowl to melt the chocolate as it’s best for conducting heat, so will help warm and cool the chocolate much faster. If you don’t have one you can use a heatproof glass bowl, but the process will take longer. 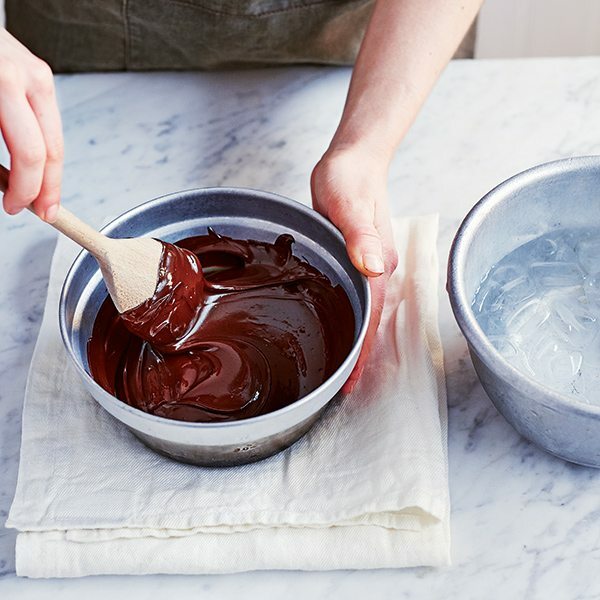 When melting the chocolate, don’t let the water in the pan beneath the bowl boil or touch the bowl of chocolate. Too high a temperature will cause the chocolate to burn or seize (solidify) – and you can’t rescue it. Don’t stir the chocolate until it’s completely melted as this, too, can cause it to seize. White chocolate is especially prone to seizing. We recommend a Superfast Thermapen thermometer (available from amazon.co.uk) as they’re so easy to use. Don’t rely on a sugar thermometer as they tend to be less responsive and less accurate. Additional ingredients in chocolate can affect the tempering process, so it’s best to use unflavoured chocolate. 1. 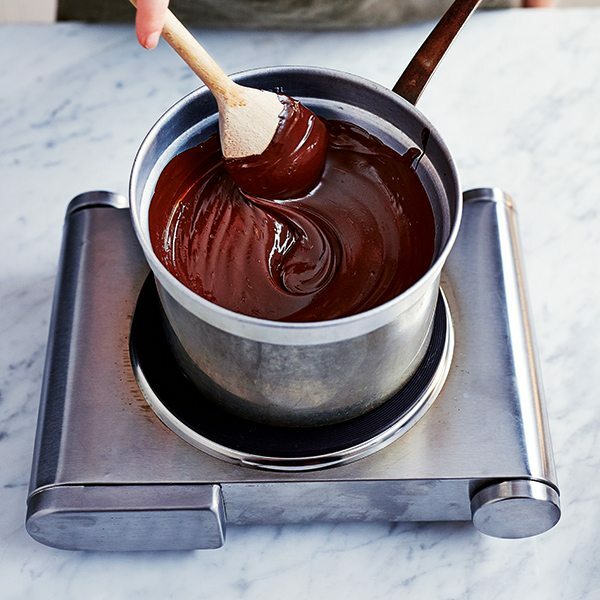 Put the chocolate in a metal mixing bowl and melt over a pan of barely simmering water, making sure the water doesn’t touch the bowl. When melted, stir the chocolate briefly, then measure the temperature using the thermometer. When it reaches 45°C (if it gets any hotter it could burn), remove the pan from the heat. 2. Half-fill a large bowl with cold water and ice. Put a clean tea towel on the work surface next to it. 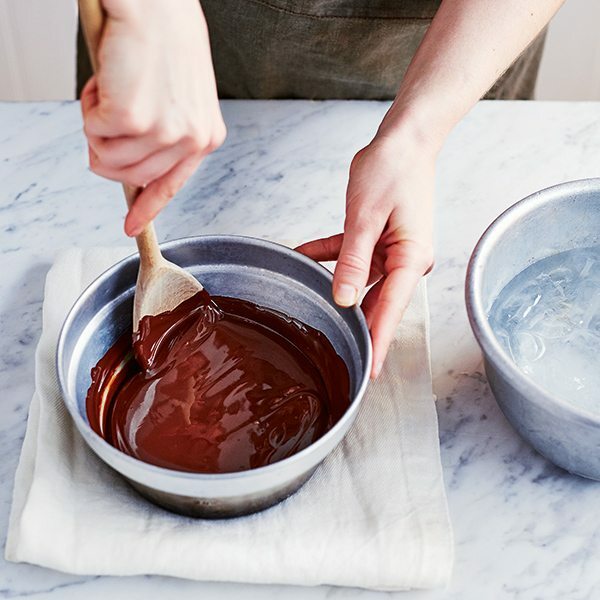 Dip the base of the chocolate bowl into the iced water for 2 seconds, then put it on the tea towel to prevent the work surface getting too wet. Scrape the chocolate from the outside of the bowl into the middle, then stir. This brings the cooler chocolate from the edge into the centre, lowering the overall temperature. Repeat the process, only putting the bowl in the iced water for a maximum of 2 seconds and making sure to scrape the inside of the bowl. Each time, the chocolate will get slightly thicker. When it has the consistency of chocolate spread, check it with a thermometer; it should be 28°C. 3. 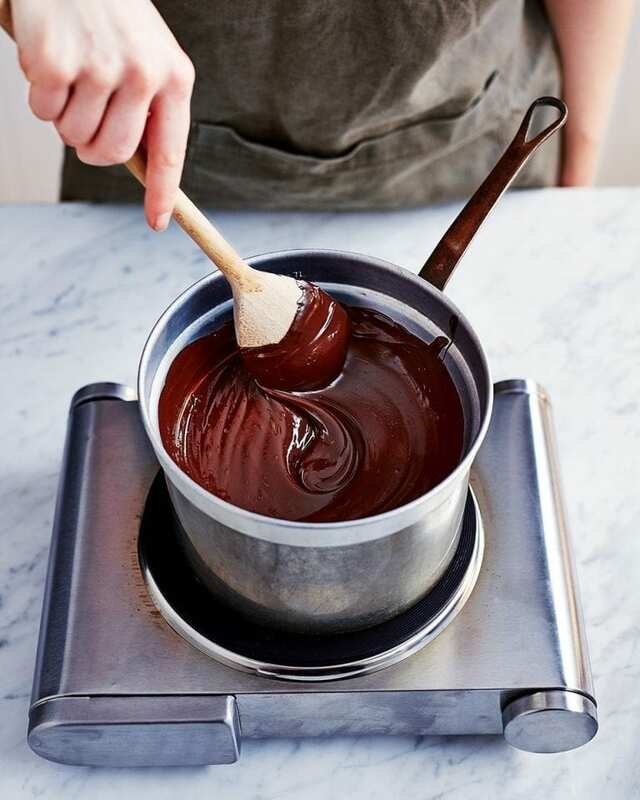 As soon as the chocolate reaches the correct temperature, put it back over the pan of hot water. Allow the chocolate to warm until the shine just comes back but it doesn’t become too liquid. The temperature should be 31-32°C when the chocolate is ‘in temper’ or at the right temperature. The chocolate will stay in temper for a while but, when using the chocolate, if it starts to cool down too far, warm it slightly as before. Only do this once or twice and ever so slightly as too much warming can bring the chocolate out of temper again.